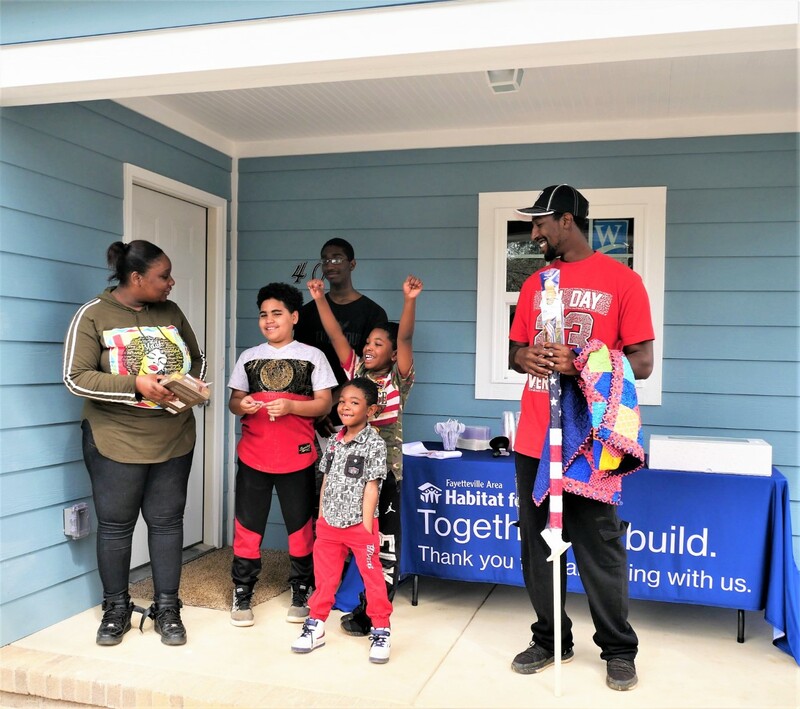 The Davis family got the keys to their new home on Friday, March 15, after a three-year wait and 300 hours of work – what Habitat for Humanity calls “sweat equity.” After the well-wishes from Fayetteville Area Habitat for Humanity and the Clinton branch of the State Employees Credit Union, two words rang out above all of the others. “I’m excited!” shouted Treshon Davis, 8, with both fists thrust skyward. The family had traveled a long path to get to this day. But now, Treshon and his three brothers; his mother Mandy, a full-time mother; and father Jeremy, who works at a Clinton tire dealer, planned to begin moving in that afternoon. The Davis home is part of the Fayetteville-area affiliate’s plans to build five homes at the Williams Street site. The house is part of the Mountains-to-the-Sea Challenge, a $10 million initiative of the State Employees Credit Union Foundation to build a Habitat for Humanity home in each of North Carolina’s 100 counties. Once the family assumes a zero-percent-interest mortgage from SECU, the funds are returned to the Habitat affiliate so that another house can be built. The Fayetteville-area affiliate plans to put five homes on the Williams Street site near the Davis home. Treshon Davis raises his hands and shouts “I’m excited!” at the dedication of his family’s new home March 15 in Clinton. From left are his mother, Mandy; brothers Jaevion, Cameron and Raeqwon. At right is their dad Jeremy.